As a driver, there are some situations you should know how to identify and handle. After all, you don’t always have a passenger around to help! One of these situations is a tire blowout. Sure, you take great care of your vehicle by bringing it to our Winston-Salem auto repair center, but these uncommon incidents can still happen, so it’s a good idea to know how to deal with them. Check out our helpful tips below! When your tire pops while you’re driving, you’ve experienced a blowout. As a result of the damage to your tire, you rapidly lose all the air pressure. At that point, all you’re driving on is a wheel on the ground, which is very dangerous and must be rectified immediately. What Do I Do if a Blowout Occurs? A blowout is scary but manageable. The first step is important: don’t panic! If you’re traveling at a high speed, keep your foot on the gas pedal and steer out of the skid. Then, pull over as quickly as possible and call our Winston-Salem auto repair experts for further advice. We can point you in the right direction and will be happy to help when you arrive! How Do I Prevent a Blowout? Blowouts are caused by three main things: excessive wear, underinflation, or a defect in the tire itself. Keeping your tires properly inflated is the first step, and regular tire upkeep will be infinitely helpful also. Get your tires rotated and replaced regularly, and ensure that the tread wear is even. If there’s a particularly bald patch, your tire is more susceptible to a blowout. If you think your tires need some work, visit Frank Myers Auto Repair! We perform routine maintenance in addition to our other more intense work, and we’ll be happy to help you. The onset of fall indicates a shift in the weather, and with it, a change to the way you drive. As driving conditions change in some unexpected ways, you need to be ready to adapt accordingly. 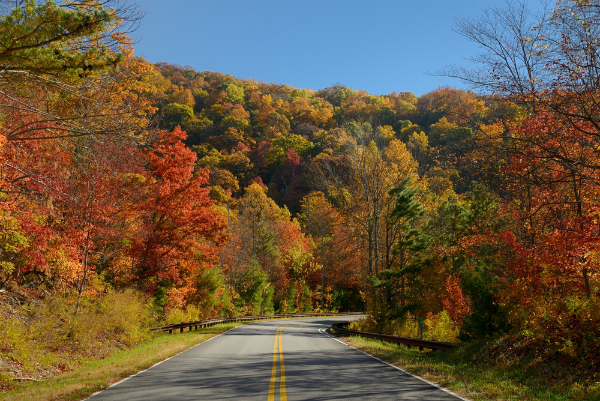 Our Winston-Salem auto repair center has a few tips to make sure you stay safe this autumn. To start, make sure your vehicle is ready for changing climes. Drivers looking for excellent auto repair can consult with our Winston-Salem experts, who will advise and assist with prepping your car, truck, van, or SUV for winter. Procedures like checking your tires and replacing your windshield wipers seem small, but add up to be a huge help down the line when you’re navigating shaky driving situations and wet weather. As the leaves start to change and fall to the ground, be cautious. Wet leaves are comparable to ice when it comes to your tires, so it’s imperative to approach layers of wet leaves slowly and avoid hard braking. Though we inspect each vehicle on our lot carefully to ensure they’ll keep you safe, there’s no substitution for driver awareness, so make sure you’re on the lookout! Hey, who turned up the sun? If you noticed the light around your commute time home is a bit strong, it’s because of daylight savings time. Around the time of the fall equinox, you may experience intense sun glare around sunrise and sunset. Prepare for this by investing in a pair of good sunglasses, keeping your windshield clean (dirt and grime can make it even more difficult to see), and, if necessary, sticking to north/south roads. Compromised visibility means compromised safety! Being safe on the roads is a paramount priority, and adapting to new seasons can present unexpected changes. Prep for the upcoming cool weather! Visit Frank Myers Auto Repair for service and we’ll make sure your vehicle is ready for fall. A road trip is a great American pastime. This country has hundreds of thousands of miles of highway sprawled all over it, connecting rural scenes with urban paradises. However, you don’t have to go far to experience breathtaking roadside vistas. Some of the best road trips in the country are right here in North Carolina. For starters, take a look at the Cherohala Skyway. This highway, which spans through the Cherokee National Forest in Tennessee and North Carolina’s Nantahala National Forest, was built with dedicated roadtrippers in mind. This highway was built for sightseeing, and it offers drivers an immersive experience with some of the most gorgeous scenery in the country. At 43 miles long, it’s perfect for a day trip. Another nearby expedition is the fabled “Tail of the Dragon,” which is a specific segment of U.S. Route 129 built for drivers who love a challenge. This 11 mile strip has 318 curves, winding its way along the North Carolina/Tennessee state line. The Tail of the Dragon is a dream destination for owners of performance vehicles or motorcycles, who can take in the wonderful view of the flora and fauna while enjoying the thrill of maneuvering their vehicle purposefully around the bends and turns in the road. Before you hit either of these storied highways, make sure your car, truck, van, or SUV is primed and ready for the challenge. With routine maintenance from our Winston-Salem auto repair center, your vehicle will be able to handle these roads without breaking a sweat. Let all your worries drift away as the open road unfolds before you. These road trips will help you get a glimpse of something you won’t find anywhere else- the exquisite beauty of North Carolina and Tennessee. A day drive down these highways is an idyllic and budget-friendly way to spend an afternoon. Before you do, visit Frank Myers Auto Maxx and get your vehicle looked at. After all the fastest way to put a damper on an awesome trip is to encounter a mechanical problem that could have been caught beforehand! We look forward to seeing you. It never hurts to look for new ways to get the most out of your vehicle. How’s your gas mileage been lately? Even when it’s good, it can probably be better! Follow these tips from our Winston-Salem auto repair center– you may find new ways to change your routine and get more for your money at the pump! We’ll start with the biggest challenge in this entire list: drive more slowly on the highway. You may find this to be pretty difficult- who can resist the allure of a flat stretch of open road? But dropping by even 5 miles per hour can save a lot of fuel, and save you money on your next trip to the pump. No matter your speed, staying on top of maintenance is paramount. Even minor issues with your vehicle, such as tires with low inflation, can compromise your gas mileage. Regular oil changes, brake inspections, and other routine maintenance checks from the technicians at our Winston-Salem auto repair are great ways to keep your car, truck, van, or SUV at its best. A couple more tips may alter the way you drive, but it’s worth it: things like fast acceleration, hard braking, and excess weight substantially reduce efficiency. Relax a little when you’re behind the wheel, and make sure that if you’re lugging around heavy things, you remove them as soon as possible. When you enjoy the ride, keep your car less crowded, and take your time: you’ll see results in your tank! Finding professionals who can keep your vehicle in top shape quickly and efficiently can be a challenge, but not to worry. Contact Frank Myers Auto Repair with your questions and we’ll help you with setting up an appointment to visit us for the routine maintenance your vehicle needs!